Collectable Automobile is a bi-monthly magazine from the US charting automotive history with the added bonus of no adverts. 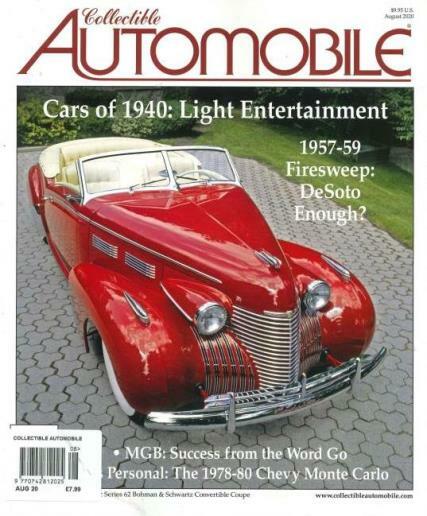 Buy a single copy or subscription to Collectible Automobile magazine. It is the publication for both the car historian and the casual observer. Each issue brings automotive history to life with sparkling color photography and bright, sharp writing. Features articles on special interest cars from 1930-1980, and regular columns profiling auto industry figures, future collectibles, models and auto advertising. Excellent. Good quality paper, well printed. Very varied content, very little advertising and full of colur photos. Possibly the best car magazine available anywhere. A beautiful publication for those interested in the span of automotive history and no advertisements - one of the few good things to come out of America!